Forever aspiring to refine and perfect the fast-food experience, McDonald’s has increasingly sought to remove the pesky human element, whose erratic idiosyncrasies have long proved a hindrance to the efficient dissemination of hamburgers. Such innovations have included turning the outmoded process of eating a Big Mac in peaceful shame into a “Restaurant Experience,” complete with “proximity technology, personalization, and smart packaging,” as well as imagining a future where the sky is blotted with McDonald’s drones, raining their special sauce from above. 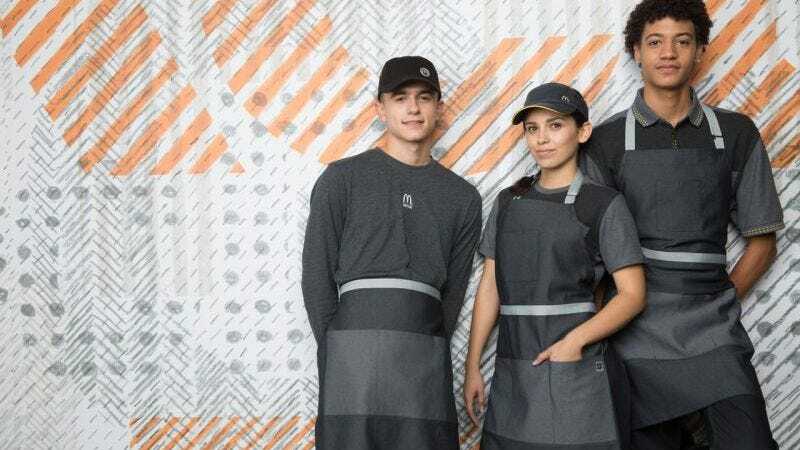 And now the company has taken the next logical step toward helping humanity have its allotted break today, unveiling new McDonald’s uniforms that better reflect the techno-dystopian Playplace we live in. “Individuality is important to McDonald’s restaurant employees,” McDonald’s says in a press release, charitably recognizing that many of its workers are separate entities from their stations, some even boasting identities and interests that go well beyond operating deep fryers. As such, the company partnered with designer Waraire Boswell to create these fun, flirty, uniquely gray-on-gray uniforms that can provide an “easy transition from the restaurant to a social environment,” where they may engage with their fellow civilians in more casual discussions of deep-frying techniques. The new looks will be distributed to all 14,000 of its U.S. locations beginning this month, their total elimination of distracting colors facilitating the orderly consumption of beef discs and potato sticks by an estimated factor of 40 percent, under the watchful eye of Commander McCheese. Still, lest you think their monochromatic drabness somehow runs counter to the notion of that all-important individuality, McDonald’s points out that its uniforms also include a denim apron that “may be worn full or as a half apron to fit restaurant employees’ personal style.” Personally, I don’t know that I would trust some insouciant, half-apron rebel to hand me a Serenity Meal. But leaving that up to the manager’s discretion is what makes McDonald’s the industry leader in acknowledging that free will has not yet been totally eradicated.